In different places, especially online, it is said that the chiltepin were almost impossible to grow. Well, it’s bull. They are usually wild peppers or brought into cultivation rather recently, so there are some things one should know and consider. – Just trying to grow them like any other chile pepper sometimes does cause some problems. First of all, Capsicum annuum var. glabriusculum oftentimes has one of the traits of wild chile peppers: seed dormancy. Due to that, it is a bit more difficult to get chiltepin seeds to germinate, and germination is less certain. The most important factors are patience and warmth. There are many stories of how seed dormancy is broken by passage through a bird’s digestive tract, and one can experiment in many ways (some people go so far as to feed chiltepines to chicken…). In my experience, if the seeds are still viable, they will germinate given a warm enough place and enough time (admittedly, this included one batch I had left outside in the backyard from spring to summer, sitting in the sun, rarely getting water again, believing it must be dead seeds – until they sprouted like weeds); seeds which do not germinate at all are probably duds (which seems to happen a lot with web shops abusing the chiltepines’ status as “difficult to grow” to sell seeds which are no good – and probably would not be chiltepin but some ornamental type). After germination, chiltepin still needs time to get going, and certain conditions: rather hot, preferably with slightly elevated humidity, with lots of sun, but not too much direct exposure. Growing in a greenhouse or under netting works well. When conditions are right, they grow very quickly. 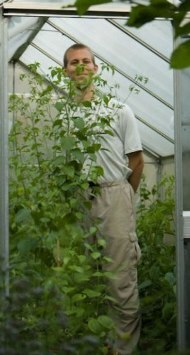 It is not unusual to see chiltepin plants growing to 1 m (3 feet) of height in a few weeks, 6 feet in a few months. Branching tends to start rather late, however. So, to keep the plants to manageable height, it may be advisable to cut the main growth at some point. Cutting seems to be handled rather well in general. One does need to know, however, that the chiltepines naturally grow long, arching branches (imagine that they would grow below – and into – nurse plants providing shade and support). Flowers are produced at the branching points, so it is advisable not to cut branches too early. A part of why they can handle cutting is because they can also freeze back slightly. I.e., cold temperatures that kill off only the branches but do not affect the main stem lead the chiltepines to regenerate from buds on the stem. Of course, as with all chile peppers, this really only applies to cold spells, and not too cold ones at that! "Since September... Are you on the Southern hemisphere? If..."
"Oh sheesh, completely forgot your question :( It's... very..."
"Do you also end up with errors (images not loading) on..."
"I couldn't guarantee that they haven't been..."
© 2019 ChiliCult. Theme by Anders Norén.